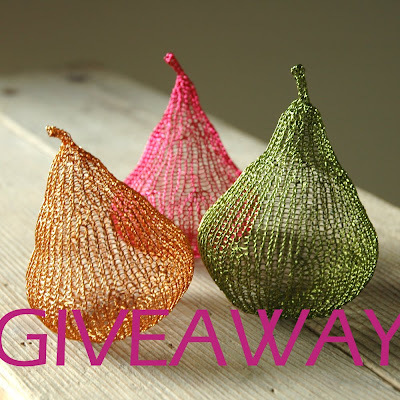 The holidays are almost here and hunting for Christmas gifts is on its way, for those of you who love to give presents they made with their own hands I offer to try and win this fab tutorial for making my exquisite Provencal pears. What can I say? I love everything from your shop! How I wish to be the lucky one!!! I love the mini Winter Silver Bell earrings…sooooo pretty! I haven't stopped by your shop or blog in a bit so I was glad to have stumbled on this again. All your finished items are beautiful, Yael, but I would choose the PDF for making pixie beads myself! Wow what an offer!! would like to learn how to make these yummy pears! My favorite item in your shop would be Decorative silver giraffe flower vase. I also love the jewerlry only can't wear earings myself. the Gold filled bracelet in crochet is so feminine and delicate! love it! I love the Gold filled bracelet in crochet. And the cute Exquisite Provencal Pears! I Love the Feminine Round Lampshade!! oooh, not easu to choose!!! well, but the pomegrantaes are since long on my wsh list too!!! It is a difficult choice. I really love your Scheherazade atmosphere lampshade http://www.etsy.com/view_listing.php?listing_id=16399246 your work is beautiful! I adore these! Of course, in my fave color, BLUE!!! Also love your story for inspiration! I like the sunflower necklace and the daisy necklace and the pears. I can;t work out which I like more though. It's hard to pick a favorite – all of your items are unique and lovely. I have to go with the Magical Disk Earrings. They are beautiful. Thanks for having a giveway! I would choose the tutorial for your magic hoop earrings in Listing # 33541556 because a tutorial is really three gifts in one: your recipient gets the initial gift of opening the tutorial, the second of actually making the piece(s) and the third of wearing the piece(s). What a bonus for both gifter and giftee! I have never seen anything like your style. Very creative. wow your shop is fantastic! i love it all! so unique too! hmm hard choice but these earrings really caught my eyes!